This notion cannot be found anywhere “in American politics, in American media, in American academia, in American fantasy football chat rooms.” Not even “among weird, conservative fringe media figures that you might not know about, but the President might love.” No one has ever written, spoken or heard anything remotely like this until it was cooked up by Putin’s party hacks. And you should be absolutely, utterly, deeply terrified that Trump has somehow got hold of a mangled, drug-addled version of this idea, because he could have only gotten it from Putin’s own party members. Because, again the idea does not exist in nature anywhere else. 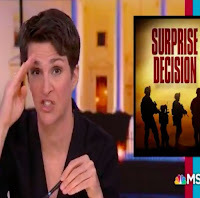 And Maddow knows this, people, because she spent one whole day looking to find some trace of this non-existent in nature idea! And if you aren’t absolutely chilled to the bone, to the marrow, chilled all the way down to your quantum particles by this, then God help you. You must be a Kremlin dupe, like those Black Lives Matter rubes or those Dakota Pipeline saps. Or a paid Kremlin stooge. Anyway, pace Maddow, there were Islamic terrorist groups in Afghanistan (although they were called “freedom fighters” when they were later invited to Reagan’s White House.) They were engaged in wholesale violence that further destabilized an already unstable, badly governed state. The Soviets did point to this as a factor in their disastrous decision to intervene. The United States did covertly support this jihadi uprising before the Soviets moved in, and continued this support throughout the conflict (including, as the Washington Post reported, providing training manuals for terrorist tactics and even schoolbooks for children that promoted jihad against the secular infidels). All of these facts have been discussed and debated openly and freely in the US media and academia for years. Whole books about the complexities of the Soviet invasion, including these facts, have been written by reputable academics, diplomats and historians. Perhaps Maddow spent too long doing her serious journalistic research in “American fantasy football chat rooms” to avail herself of any of this information. I learned these things from reading readily available mainstream books and articles — some of them published even before Putin was elevated to the Russian presidency by America’s favourite dipsomaniac, Boris Yeltsin. I didn’t get them from Putin party insiders or encrypted Kremlin text messages or even from Facebook memes.